As I write these words, the news out of Washington, DC is that a fiscal cliff deal has reached an impasse in the Senate. Nevertheless, I was surprised to see ES futures up modestly. Regardless of the outcome of the fiscal cliff negotiations, a review of global equity markets indicate that the leadership is outside the US and a fiscal cliff relief rally (when it comes) would be a good opportunity for American investors to diversify their holdings outside the country. Consider this chart showing the relative returns of US stocks compared to MSCI All-Country World (ACWI). US equities peaked out on a relative basis in July and have been underperforming global equities ever since. Despite the sunnier outlook shown by the American economy relative to many parts of the world, this analysis shows that the outlook for US equities may not be so bright in 2013. When we analyze the weightings in ACWI, the main components by weight are US stocks, developed market stocks (EAFE) and the emerging market stocks. EAFE is composed mainly of Japan and Europe, with a minor weight in the Asia Ex-Japan region. Any way you look at it, developed market stocks, as represented by EAFE, are showing relative leadership. They bottomed on a relative basis in August and have been roaring ahead ever since. In December, these stocks staged a relative breakout indicating sustainable strength. Much of the relative strength in EAFE comes from Europe, which I have written extensively about before (see Europe poised for a renaissance). The other major component of EAFE is Japan and Japanese equities have recently staged a turnaround. The chart below of Japan against ACWI shows that Japanese stocks have rallied through a relative downtrend that began in October 2011. The last major component of ACWI are emerging market stocks. These stocks bottomed on a relative basis in early September and they have been outperforming ever since. Technicians can be encouraged by the fact that EEM staged a relative upside breakout against ACWI in early December and they have been on a tear ever since. Much of that strength can be attributed to the perceived soft landing in China. In conclusion, these relative return charts show that US equities have been trailing global stocks since the summer of 2012. Regardless of how the fiscal cliff resolves itself, this analysis suggest that equity investors are better served by a larger weighting outside the US. My personal favorites are Europe and the emerging markets (in that order), but the bottom line is: avoid US stocks for the time being. The cover of Barron's features a bullish article on Europe. I agree. The Barron's article states that the STOXX 600 trades at a forward 12 month P/E of 11.5 and sports a dividend yield of 3.8%. Looking longer term at the weekly chart, the index has managed to rally through a long-term downtrend that began in late 2007. Bottom line: The short and long term technical picture, as well as attractive valuation of European equities, suggest that these stocks are poised for significant gains and outperformance in the medium term. If I had to make one forecast for 2013, this would be my favorite long for the coming year. In these pages, I have tried to make sense of the world from a financial and quantitative viewpoint, so let me try to focus on a framework that is appropriate for the season. Sometimes this form of analysis can provide an economic framework for analysis showing the incentives for different actors that is different from conventional wisdom. Living with a nuclear Iran would require expensive countermeasures and create significant risks. But going to war to impede Iran’s nuclear ambitions, and containing the subsequent chaos – including oil-price spikes, increased regional volatility, and reduced American strategic flexibility – would be far more costly. If Obama stands behind his first-term declarations, the world will pay a very high price. Should that ever-elusive peace deal with the Palestinians one day materialize, Israel’s economy would be ever so much stronger, probably growing at 5% to 7% per year, according to 2010 estimates from Bank of Israel Governor Stanley Fischer. Part of that boost would come from Israel’s ability to cut its military spending, which today is about 7% of its GDP, just a fifth of its mid-1970s levels but still painfully burdensome. In contrast, the U.S., despite its military presence around the globe, spends less than 5% of its GDP on the military; countries with peaceable neighbours such as Denmark, Sweden and Canada typically spend 1.5% or less. But would peace serve Palestinians as well? Probably not. As a fully fledged state, Palestinians would no longer have an entitlement to Israeli aid and with the high-profile Israeli-Palestinian issue defused, Arab oil states that have reluctantly provided aid in solidarity against Israel would be able to bow out. More importantly, with the end of unrest Palestine would soon lose the raison d’être for international aid from Western countries and agencies such as the World Bank — the belief that the West could leverage its aid to end conflict and arrive at a peace treaty. Foreign aid diplomacy, in fact, has driven the peace process since Bill Clinton in 1993 brought together PLO chairman Yasser Arafat and Israeli prime minister Yitzhak Rabin to sign what is known as the Oslo Accord. Unlike Israelis, Palestinians fear they would see no glorious peace dividend — to them peace looks more like a punitive tax. Not surprisingly, while public opinion polls show Israelis to overwhelmingly favour a two-state solution in which Israel and an independent Palestine live side by side, they also show Palestinians in the Palestinian territories to overwhelmingly oppose it. Greg Mankiw once said that people respond to incentives. If we do want peace on earth, then the correct incentives must be put in place to encourage those ends. Whatever your beliefs, let me close this post with a tribute to one of the giants of science and early pioneers of mathematics, without whom quantitative finance would not be possible without his work. 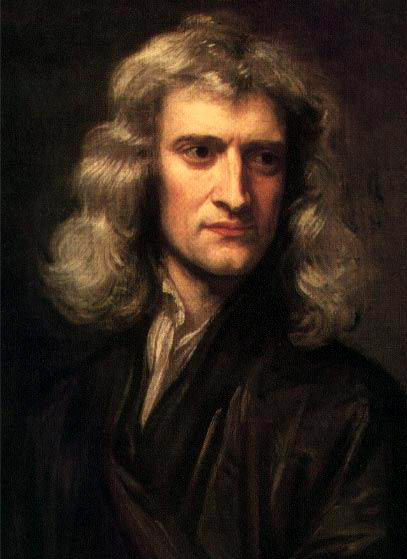 December 25 was the birthday of Sir Isaac Newton. 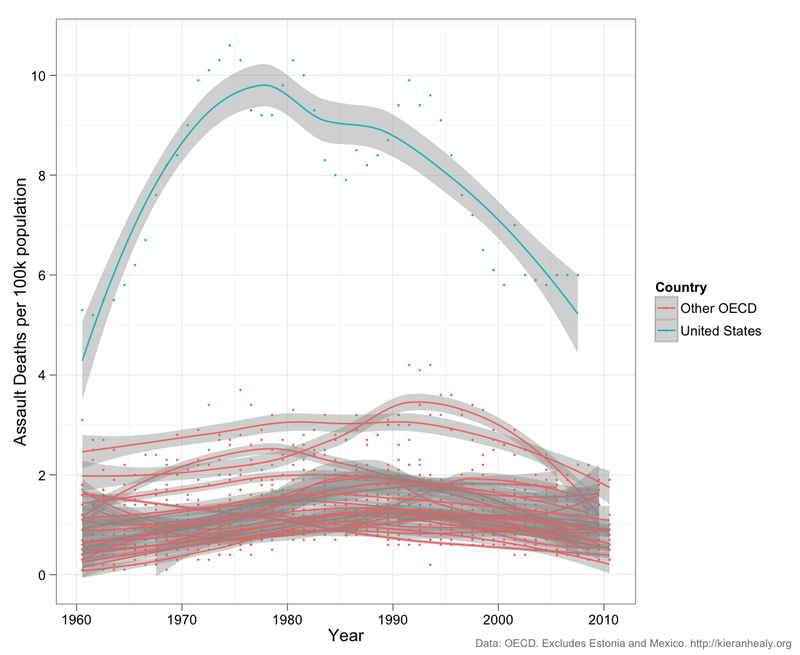 I got a lot of feedback, mostly negative, from my post last week On the kinds of conversations regarding the shooting tragedy in Connecticut. Most of them were in the form of "you don't know what you're talking about", but they don't specify what they object to. Were there objections that I pointed out that guns are part of American culture? There are benefits to gun ownership, just as there are benefits to owning a car. Were readers upset that I pointed out that there are risks to gun ownership? Guns are, by definition, dangerous - they are designed to kill and having a weapon in your house and possession raise your risk level, just as owning a car is risker (you can run over people with it). The debate is over whether the benefits outweigh the risks. What I do find curious is that the gun ownership constituency tends to be of the "get the government off my back" variety and, at the same time, the NRA's called on the federal government to station police officers in every school in the country. Is this where we've come to? A "get the government off my back" crowd calling for more government? How about deploying elements of the 101st Airborne or 4th Mountain in schools? Wouldn't that deter the "bad" guys even more? If you do believe in gun ownership and your philosophy is "less government is better government", then there is a better way forward - let the market do it. Just as everyone above a certain age is allow to own a car, everyone who is qualified could be allowed to own a gun. Just as car ownerships are required to have insurance, gun owner should be required to carry a large level of liability insurance in case the guns under his control are used improperly. That way, we can let the market regulate gun ownership rather than the government. Insurance companies are in the business of pricing risk and they should be able to price the cost of gun ownership properly. That way, the market can create barriers to the "crazies" owning guns. No doubt, the level of gun ownership will decrease under such a proposal, but the "right kind" of gun ownership, i.e. responsible ones, will be largely unaffected. In America, everyone who is qualified is allowed to own a car, but not everyone is owns one because of the costs involved. Under this proposal, the free market would tend to weed out the higher risk cases. If America is the embodiment of the embrace of free markets, then this would be an important step in the application of this principle pertaining to the gun ownership and control debate. Corporate insiders are no longer on the side of the bulls. After all, the stock market is barely 4% higher today than then. And though a return of that magnitude in one month’s time is nothing to sneeze at, is that really enough of a rise to justify such a big shift in insider behavior? Either something has led them to change their minds about their companies’ longer-term prospects, or they have become short-term traders like the rest of the market. It’s probably a little bit of both. Since the government doesn’t gather data on the reasons for insiders’ behavior, we don’t know for sure. But regardless, the picture the data paint is unmistakably bearish. They are selling in anticipation of higher capital gains taxes in 2013, especially when it appears a fiscal cliff deal is near. Assuming that the Mayan Apocalypse doesn't happen this Friday (here is one way you hedge the end of the world), there is no need to panic just yet. Explanation #2 is a perfectly plausible reason for the rash of insider activity as 2012 draws to a close. In that case, I would wait for the insider activity data in January to see if insiders are indeed selling because of deteriorating corporate fundamentals, or for tax related reasons. Where is the resource stock rally? Regular readers know that I have been tactically bullish by calling for a Santa Claus rally. Indeed, with relative breakouts seen in emerging market and European equities (see Intriguing head and shoulders patterns), the weight of the evidence suggests a friendly risk-on environment. Indeed, the relative performance of the Morgan Stanley Cyclical Index against the market is also suggestive of a bullish view on the economy and risky assets. Here's what's bugging me. With most of my indicators in bullish territory, why is the resource sector lagging? In particular, why aren't Materials and Energy leading this market upward? Until I can see participation from the resource sector in this rally, I remain constructive but cautious on this bull move. Here is the relative performance of the cyclically sensitive Materials ETF (XLB) against the market (SPY). Materials remain range bound on a relative basis. While these stocks have shown some degree of relative strength in the last couple of weeks, they are by no means in a relative uptrend indicating sustainable leadership. This pattern is not restricted to American stocks. The Basic Materials sector in Europe is showing a similar pattern of relative performance. More worrisome for the bull case is the performance of the Energy sector, which is in a minor relative downtrend against the market. Nevertheless, I remain cautiously bullish on the outlook for commodity prices. The chart pattern for Dr. Copper, which is an important cyclically sensitive industrial commodity, appears to be constructive. The price of the red metal remains in an uptrend but, at the current rate of ascent, it will encounter important overhead resistance. The truth of the matter is, the energy complex is underperforming (for reasons unknown). Nevertheless, a relative performance chart of the equal weight Continuous Commodity Index (CCI) against the CRB Index shows a relative uptrend indicating positive breadth. To explain, both the CCI and CRB have the same commodity components. While the CCI is equal weighted, the CRB is liquidity weighted, which gives a higher weight to the energy complex. Thus the CCI to CRB ratio is a measure of market breadth in the commodity complex. The relative uptrend shown in the above chart is an indication that the general commodity complex is performing better than the headline CRB - which is one reason why I remain cautiously bullish on the commodity outlook. Bottom line: I am watching for commodities and commodity-related stocks to start outperforming as a sign that this rally has legs. If we don't see sustainable relative strength breakouts from the Materials and Basic Industry sectors, then I would interpret such a development as a negative divergence and a caution flag for the bulls. For now, I am inclined to give the bull case the benefit of the doubt, but I remain cautious. On the kinds of "conversations"
My heart is breaking for the families of those affected by the events in Newtown, Connecticut this morning. Just as I'm sure yours is, regardless of your stance on the gun issue. Now, we're going to hear people talk about this sudden need for a "national conversation" or a some grand debate over guns and gun control. I can't think of a more pointless waste of time. He correctly pointed out that there are entrenched views on both sides of the gun control issue and incidents like the latest mass shooting aren't going to have a significant effect on peoples' attitude. Mrs. Humble Student of the Markets was particularly upset with the news of the shooting, largely because we have a 7th grader and we used to nearby Stamford, Connecticut. Consider this financial analogy. There are some obvious benefits to financial derivatives. They are useful tools for spreading risk around and an investor can use the leverage inherent in derivatives to better enhance his useful of capital. Now imagine allowing every mom and pop investor to use derivatives such as options, futures and swaps, whether they be listed or OTC, in their portfolios. Regardless of the benefits or derivatives, do you think that there would be more or less market volatility under such a regime? Addendum: Remember, derivatives don't destroy balance sheets, people destroy balance sheets. Another day, another rally. While the stock market's response to the Fed's QE4 announcement was disappointing for the bulls, my review of some charts indicate that the bullish risk-on case remains intact. I wrote on Monday that I was seeing bullish upside breakouts in selected stock indices around the world (see Key tests of market psychology). Further analysis showed that upside strength is now spreading and I am now seeing greater upside participation in the bull move. Starting in Europe, we saw the STOXX 600 stage an upside breakout last week. That strength has now spread to eurozone equities, as represented by the Euro STOXX 50, despite the news of the Monti resignation and Berlusconi revival. A relative return chart of the Euro STOXX 50 ETF (FEZ) against the MSCI All-Country World Index ETF (ACWI) shows an intriguing inverse head and shoulder formation forming. With the caveat that you shouldn't be betting on a head and shoulders pattern until it breakts out, I am not counting my chickens until then hatched. However, should FEZ stage an upside relative breakout to ACWI, the potential outperformance could be considerable based on the technique of setting and upside target based on the distance from the head to the shoulder breakout level. As well, emerging market equities (EEM) staged a relative breakout against ACWI in the context of a reverse head and shoulders pattern. When I step back and look at the bigger picture, upside relative breakout by European and emerging market equities add up to a friendly environment for the risk-on trade. 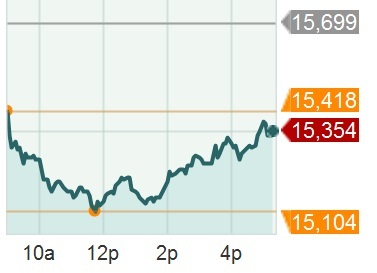 You can tell a lot about the likely market direction by the way it reacts to news. By any measure, the bulls appear to have seized control of the helm based on yesterday's market action..
Can the Shanghai Composite rally through the downtrend line? How will European stocks react to the Monti resignation news? What will the Fed do on Wednesday and how will the market react? We have answers for two of the three. The Shanghai Composite staged an upside rally through a downtrend that began in March. While the index may not necessarily head straight up from here, the technical outlook for Chinese stocks is far less bearish than it was a week ago. Score one for the bulls. Stock markets sold off at the open on Monday, but rallied as the day went on and closed near the highs of the day. As I wrote yesterday, the STOXX 600 had staged an upside breakout through technical resistance. The index not only held on to its breakout but closed higher on the day, which is bullish. Italy's MIB index was the hardest of of the European bourses on Monday. Nevertheless, it did rally to close near the highs of the day - another bullish sign. This kind of market action is indicative that sellers are exhausted and the bulls are in control of the tape. Score another for the bulls. So far, the bulls have score two (China and Europe) and the bears none. I will be watching closely Wednesday to see the market reaction to the FOMC decision. From what I have seen so far, it looks like the Santa Claus rally is underway. Full Disclosure: Long FEZ, FXI. OK I was wrong about NFP on Friday (see Take the "under" in the NFP sweepstakes) and, as someone with a tactical bullish view, I was also disappointed with the stock market's reaction as it sold off after the announcement in the morning. Nevertheless, my Inflation-Deflation Timer Model moved to an "asset inflation" reading from "neutral" early last week indicating a risk-on environment. After reviewing the charts on the weekend, I would cautiously agree. While I remain cautiously bullish, I am also closely watching how the market reacts to a couple of key events to see how the market reacts. First of all, let's start with the bull case. While chartists were watching the SPX to see if it would overcome resistance, I am seeing signs of technical breakouts indicating a Santa Claus rally may be on the way. By contrast, the broader NYSE Composite has already staged an minor upside breakout, though there is still overhead technical resistance at the 2012 highs. Similarly, the Dow (not shown) has also staged an upside breakout - another bullish sign. The SPY (stocks) to TLT (default-free long Treasury bonds) ratio, which is a measure of the risk-on/risk-off trade, also staged a minor upside breakout. Cyclical stocks continue to behave well, as the ratio of the Morgan Stanley Cyclical Index (CYC) to the market remains in a relative uptrend. Most other major stock indices around the world also had bullish technicals. Across the Pacific, in Hong Kong, the Hang Seng Index has staged an upside breakout in the context of an uptrend. The outlook for China can be best termed as cautiously optimistic. The Shanghai Composite has been rallying in the last week to test downtrend resistance. If the index can overcome the downtrend line, it would represent another technical win for the bulls. Next door in South Korea, where China is its largest trading partner, the technical pattern of the KOSPI can similarly be termed cautiously optimistic. KOSPI has been rallying since mid-November and at this rate will be encountering technical resistance - much like the pattern of US equities like the SPX. Over in Europe, the STOXX 600 has staged an upside breakout. While other indices, such as the FTSE 100 and the Euro STOXX 50, are still testing their resistance levels, this development must still be regarded as bullish. 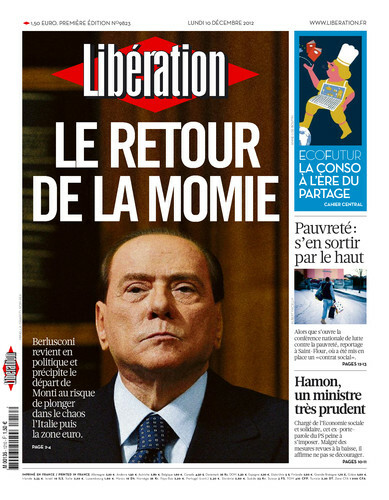 On the other hand, the news of Mario Monti's resignation and Silvio Berlusconi seeking to return to power may unsettle the markets. One of the key upcoming tests of market psychology will be how Mr. Market reacts. Has the actions of the ECB to largely eliminate tail risk cause the markets to shrug this off? Or will this news cause a major selloff? The employment report offered me no reason to change my baseline opinion that the US economy continues to grow at a slow, steady pace regardless of the quarterly fluctuations we see in GDP growth. Indeed, there seems to be little news in November's numbers. This is good news in the sense that fears that the economy is slipping toward stall speed in the final quarter of the year is not yet translating into weaker job growth. The same is true for fears of the fiscal cliff, debt cliff, austerity bomb, etc. The bad news is that we are not seeing the 200k+ numbers that the Fed is leaning towards as evidence of stronger and sustainable improvement in the labor market. That means the Fed will continue to add to its stock of assets, converting most if not all of Operation Twist into an outright purchase program next week. I expect the FOMC to announce additional asset purchases at the meeting this week (to start at the conclusion of Operation Twist). It seems the FOMC will move to thresholds, but probably not until next year. On projections, I expect GDP to be revised down for 2013, and the unemployment rate to be revised lower for 2013 and 2014. Watch the Fed news Wednesday and see how the market reacts. 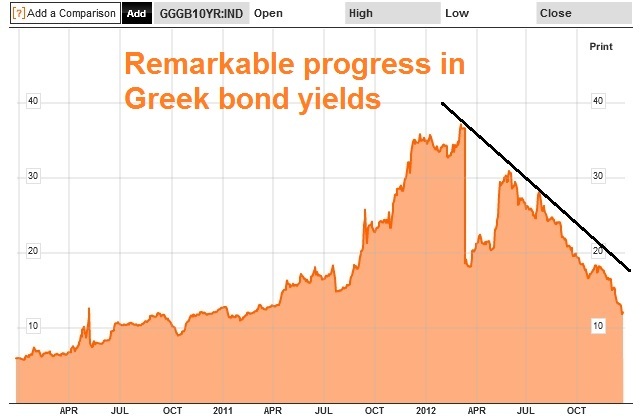 Will the market shrug off the Monti resignation or will it panic? Can the Shanghai Composite stage an upside breakout through its downtrend? What will the Fed do Wednesday and how will the market react? I hate the Non-Farm Payroll release because the market can react in a violent fashion to what is essentially noise. The error term in the NFP release is so enormous that it's meaningless. Nevertheless, we have to deal with this source of volatility. With Friday's NFP release, we are seeing signs everywhere that employment is weakening. How much of that is Sandy related, I have no idea. Gallup's unemployment results for the 30 days ending on Nov. 15 suggest that the improvement in the U.S. unemployment situation found in October was short-lived. Still, on an unadjusted basis, Gallup's unemployment and underemployment measures over the past two months show what might be expected holiday seasonal improvement. U.S. companies increase hiring for the Christmas holidays at this time of year. At the same time, superstorm Sandy distorted weekly jobless claims, according to the U.S. Bureau of Labor Statistics, and may be doing the same to Gallup's unemployment results. The presidential election may also have disrupted the job market for a few days in early November. Taking seasonal factors into account, it appears that the unemployment rate has remained around 8.0% since May. This seems consistent with other general economic data showing the economy growing slowly, the most recent of these being the 0.3% decline in October retail sales. Looking ahead, Gallup's mid-November unemployment data have generally provided predictive insight into the official BLS numbers. In turn, Gallup's results suggest that in early December, the BLS could report an unchanged seasonally adjusted unemployment rate for November. The outlook isn't entirely dire, the internals of part-time workers looking for full-time work is unchanged, indicating that the deterioration isn't serious. The consensus estimate for NFP is 93K as the Street is forecasting a serious drop from the 171K release in October. Given the inherent volatility of NFP day and the uncertainty caused by Sandy, I would stand aside. If you don't have an edge, don't bet. However, if you put a gun to my head and made me make a forecast, then given the recent indications of weakness in consumer spending I would have to take the "under" bet that it would come in below consensus. Ever since I delved into research about the combination of momentum and trend following models (see my post here), I have been monitoring sector and group leadership much more closely. Here are a few surprising groups showing either sustained market leadership or emerging leadership that are potential outperformers. The first and most obvious are the homebuilders. The chart below of the homebuilder ETF (XHB) against the market (SPY) shows XHB to be in a well-defined relative uptrend. With the housing market bottoming and the Fed's QE3 buying MBS paper to support the housing market, this is an industry that has a definite tailwind at its back. One somewhat surprising sector that may be staging a turnaround is the Technology sector. The chart below showing the relative performance of this sector against the market is showing the signs of a potential relative return bottom. The trouble with the Tech sector is that the heavy influence of Apple on the performance on the sector. AAPL continues to struggle as the stock's rally was rejected at the 200 day moving average. The negative action of this single stock is weighing down the performance of the sector. The relative performance of the equal weighted NASDAQ 100 (QQEW) as a proxy for the Technology sector tells the story of a relative turnaround in a much clearer fashion. In November, QQEW rallied through a relative downtrend that began in February and it has staged a robust relative performance rally. As further confirmation, analysis from Bespoke shows that breadth is recovering nicely for the sector. Another surprising industry that is turning around is Agribusiness. The relative return pattern of the Agribusiness ETF (MOO) is similar to the one seen in QQEW. MOO rallied out of a relative downtrend in September and has been in a relative uptrend ever since. A word of warning is warranted here. MOO is relatively thinly traded and doesn't have a lot of components. As well, the agricultural commodity complex is not showing a similar level of leadership relative to the broadly diversified commodity indices - which makes this trend slightly suspect. 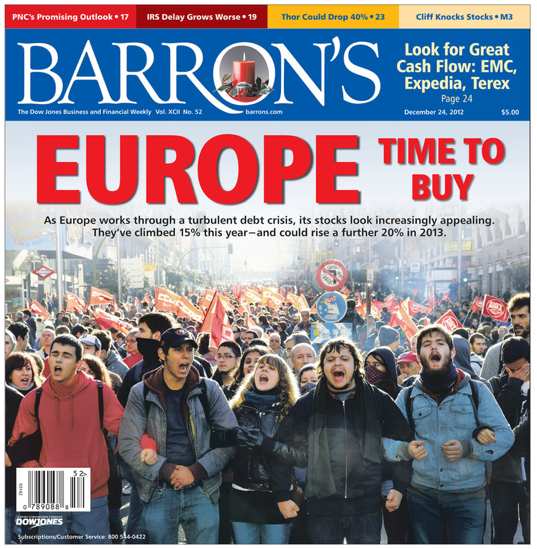 The last group of stocks that I would pay attention to is Europe. 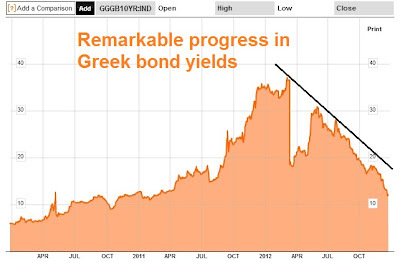 You would have to be on Mars in the last few years to be unaware of the rolling series of crisis in the eurozone. Greece, Ireland, Portugal, Spain, Italy - the list goes on and on. While the world waits for Eurogeddon, chartists are now watching the European stock averages such as the Euro STOXX 50, i.e. eurozone stocks, rallying strongly to test a major resistance level. On a relative basis, the Euro STOXX 50 (FEZ) rallied through a relative downtrend against the MSCI All-Country World Index (ACWI) in August and it has now staged an upside relative breakout. Count European stocks as another leadership group. If you do buy into any of these groups, watch the relative return charts for signs of relative weakness as they would be warning signs that they may be running into trouble. Disclosure: I am personally long FEZ and XHB. What happens after the Santa Claus rally? This market has a deja vu feeling to it. This time last year, it was faced with the prospect of Eurogeddon. This year, it's the fiscal cliff. Regular readers know that I believe that we will likely see a Santa Claus rally (see Risk on! and Waiting for a Santa Claus rally). The most likely scenario is a relief rally based on a benign resolution of the much overhyped fiscal cliff. As I look forward into 2013, the more pressing issue becomes one of what happens after the relief rally? The biggest risk to US equities is what Barry Ritholz termed an "earnings cliff", which he wrote about in late October. He was seeing signs of stalling earnings growth from large cap multi-nationals (listen to this interview with him). This is where the difference between the U.S. domestic economy and the global economy becomes critically important and where the issues surrounding the fiscal cliff and tax policy are critical. Simply put, our calculations of the rate of change in S+P 500 corporate profitability suggest that the U.S. economy, like all others, is slipping back into recession, but, that is not exactly correct. In fact, if we segregate the S+P 500 companies that tend to be larger multinationals with the majority of their revenues coming from international sources from the predominately domestically-focused S+P 500 companies, then the contrast is striking. In the U.S., the “international” companies are demonstrating a significant rate of ROE decline that would clearly be consistent with a recession. This would also be consistent with the state of the global economy. The “domestic” companies, however, are recording a slight growth in profitability. This “domestic” growth rate is dramatically different than the decline in “international” company profitability but it is not yet enough to suggest that the U.S. “domestic” economy is growing at a self-sustaining rate. This “domestic” recovery is also consistent with the evidence of a recovery in U.S. housing prices. Investors must be careful, however, in their view of a U.S. housing recovery since the high level of structural unemployment tends to argue against a sustainable recovery in housing, as compared with, a recovery due to deeply depressed prices and very low interest rates. If the fiscal cliff, therefore, is not dealt with sensibly, then the tentative U.S. domestic recovery will be lost as well, and then all bets are off. With China in a tentative recovery, the source of global slowdown is coming from Europe. Indeed, European PMIs are collapsing and eurozone economies are in recession. The macro risk in 2013 is that economic weakness in Europe has the potential to drag down China, as Europe is China's biggest export market, which create a domino effect around the world. While I understand the concerns expressed by Ritholz and Gibson, I remain cautiously constructive on the outlook for stocks, commodities and other risky assets in early 2013. I prefer to let the markets tell the story. Consider, for example, the chart of the Euro STOXX 50 below. If the eurozone economy is such bad shape, why is this index rallying and challenging resistance at the old highs? Why are industrial metals like copper rallying? While I am aware of the risks of a European slowdown pulling down the rest of the world (and my views are subject to change), I don't see the "earnings cliff" to be a major headwind for equities going into 2013 at this time. However, with equities cheap on a relative basis against junk bonds and moderately expensive on an absolute basis (see my last post How cheap are stocks? (two views)), I can't say that I'm wildly bullish either. I am only expecting modest upside for stocks in a hypothetical Santa Claus/post-fiscal cliff rally environment.